Not in United States? Choose your country's store to see books available for purchase. 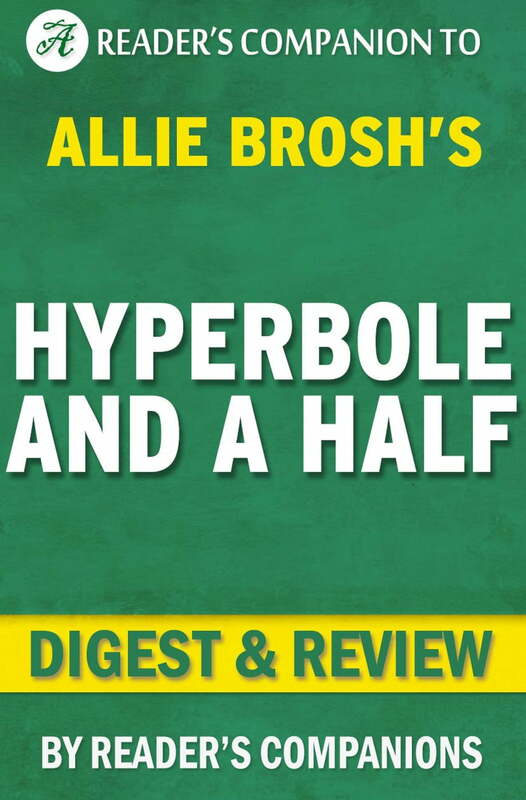 Every time Allie Brosh posts something new on her hugely popular blog Hyperbole and a Half the internet rejoices. We dare you not to. This is a book I wrote. Because I wrote it, I had to figure out what to put on the back cover to explain what it is. Brosh's debut marks the launch of a major new American humorist who will surely make even the biggest scrooge or snob laugh. We dare you not to. This is a book I wrote. Because I wrote it, I had to figure out what to put on the back cover to explain what it is. I tried to write a long, third-person summary that would imply how great the book is and also sound vaguely authoritative—like maybe someone who isn't me wrote it—but I soon discovered that I'm not sneaky enough to pull it off convincingly. So I decided to just make a list of things that are in the book: Perhaps I have underestimated my sneakiness! Publication Details Publisher: Gallery Books Publication Date: Let's Explore Diabetes with Owls. Welcome to Night Vale. Joseph Fink. Notorious RBG. Irin Carmon. Chaos Monkeys. Antonio Garcia Martinez. The Magic of Reality. Richard Dawkins. Uganda Be Kidding Me. Chelsea Handler. Why Not Me? Mindy Kaling. Not That Kind of Girl. Lena Dunham. Laurie Frankel. The Tao of Martha. Paddle Your Own Canoe. Nick Offerman. One More Thing. Yes Please. Amy Poehler. Caitlin Moran. Between the World and Me. Ta-Nehisi Coates. Business Adventures. John Brooks. The Innovators. Walter Isaacson. You'll Grow Out of It. Jessi Klein. Bad Feminist. Roxane Gay. Rainbow Rowell. Sick in the Head. Judd Apatow. How to Lie with Statistics. Darrell Huff. Zero to One. Peter Thiel. The Opposite of Loneliness. Marina Keegan. Jim Henson. Brian Jay Jones. Ben Horowitz. Turtles All the Way Down. John Green. I Still Love You. Jenny Han. Carry On. Julie Murphy. Moms Who Drink and Swear. Nicole Knepper. Women Talking. Miriam Toews. Scaachi Koul. The Road to Character. David Brooks. Crazy Town. Robyn Doolittle. We Need New Names. NoViolet Bulawayo. The Undoing Project: Michael Lewis. The Ruby Circle. Richelle Mead. As Chimney Sweepers Come to Dust. Alan Bradley. The Dead in Their Vaulted Arches. The Serpent of Venice. Christopher Moore. A Court of Frost and Starlight. Sarah J. The Empathy Exams. Leslie Jamison. The Bling Ring. Nancy Jo Sales. The Golem and the Jinni. Helene Wecker. Brandon Sanderson. Scrappy Little Nobody. Anna Kendrick. Listen to the Squawking Chicken. Elaine Lui. I Wear the Black Hat. Chuck Klosterman. Let's Pretend This Never Happened. What Happened. Hillary Rodham Clinton. Bob Woodward. The Wolves of Midwinter. Anne Rice. Home Is Burning. Dan Marshall. The Museum of Extraordinary Things. Alice Hoffman. Less Winner of the Pulitzer Prize. Andrew Sean Greer. Kingdom of Ash. Braving the Wilderness. The Hate U Give. Angie Thomas. Hillbilly Elegy. Watch How We Walk. Jennifer LoveGrove. The Astronaut Wives Club. Lily Koppel.